Maybe you’re just sick of looking at your current website. Maybe you’ve realized that a lot can be done to improve conversion rates and user experience. Whatever your reason, your website should be an accurate representation of your brand today, not 10 years ago, or even last year. Companies can no longer set-and-forget their websites. You can’t just use an online version of your brochure either. Your website must be a constant interactive encounter for your customers. That doesn’t mean you need visual changes, although many website redesigns do. Most of the time, what you need will be structural concerns to get more leads and ultimately, more business. To succeed online, you have to target what your customers need, where the problems are and what needs to improve. Our four-phase approach to website redesign helps us to discover what you need, and what you don’t, to reach your goals. Using in-house experts and streamlined process, we can redesign typical websites from concept to deployment in 60 to 90 days. This meeting kicks-off your project and reviews the results of our free website review to gauge how your current site is performing. Whether your project needs content, design and development, a few tweaks to maximize it’s performance, or a platform change, we’ll work with you to formulate a plan that focuses on what your business needs to grow. Miscommunication is one of the fastest ways a project can go south, so we take a no surprises approach in every project. In this meeting, you’ll meet your dedicated project manager and the team that’s working on your website. Schedule weekly progress meetings and get a complete timeline of your redesign from start to launch. We never use generic templates. Instead, we build custom wireframes, write unique content and sketch designs around your business, not the other way around. Your website is a big part of your online marketing. Online interaction is what converts your visitors to clients. That’s why we create built-in solutions, customized to your business goals. Once we understand if your website is generating the right leads, our team can address the issues with SEO to make sure you’re found, and the tools to ensure you’re speaking to the right people at the right time. Launch on time and on budget, with all of the support you need. Big sales improvements don’t happen overnight, so we stick around to continuously monitor and improve your site performance until you see the results you need. Our website redesigns are strategically built to serve your customers and generate leads. Typically, redesigns include SEO, custom graphic design, marketing-driven development and original content. Maybe your website doesn’t have to be one big project. Many don’t need a total overhaul. That’s why we analyse and do our homework before we sell any of our services. Start by fixing major issues, then make additional improvements over time. As HubSpot Partners certified in Growth-Driven Design, we utilize a method of launching a solid online foundation that grows over time, as we work with your team to improve the buying journey of your customers. 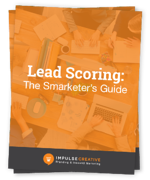 With a proper lead scoring strategy, you’ll be tracking your potential customer's behavior and web activity to determine their level of interest in your company.